Global leaders of the air traffic management (ATM) industry met in Copenhagen at the CANSO Global ATM Summit and 21st Annual General Meeting 12 – 15 June to discuss key challenges and opportunities for the industry. An international event for the key players in ATM, the CANSO Global ATM Summit 2017 explored the rapidly changing nature of the ATM industry and how CANSO and its Members should prepare for and adapt to that future. The theme of the Global ATM Summit was ‘Flying high: onwards and upwards’, highlighting how the ATM industry is taking significant steps to ensure that it is efficient and effective, and embracing new developments in airspace use, in particular commercial space users. The scene was set by opening keynote speeches from Rickard Gustafson, President and CEO of SAS, and Alexandre de Juniac, Director General and CEO of the International Air Transport Association (IATA). The Summit then explored new operating models, partnerships and new players that are transforming the industry and shaping a new future for ATM. Roberta Neri, CEO of ENAV, the air navigation service provider (ANSP) of Italy, described the lessons and process of privatisation and how ENAV became the first ANSP to complete an Initial Public Offering (IPO) of ordinary shares on the stock market. Representatives from FAA, Virgin Galactic and Sierra Nevada Corporation showcased the latest developments in commercial space transportation, and panellists from FAA-ATO, DSNA, Airports Authority of India, EUROCONTROL and ENAC explored how ATM regulations and operations are already taking steps to accommodate and encourage this rapidly growing sector of airspace users. Teri Bristol (COO, FAA Air Traffic Organization) was elected as Chair of the CANSO Executive Committee and Thabani Mthiyane (CEO, ATNS) was elected as Vice Chair. 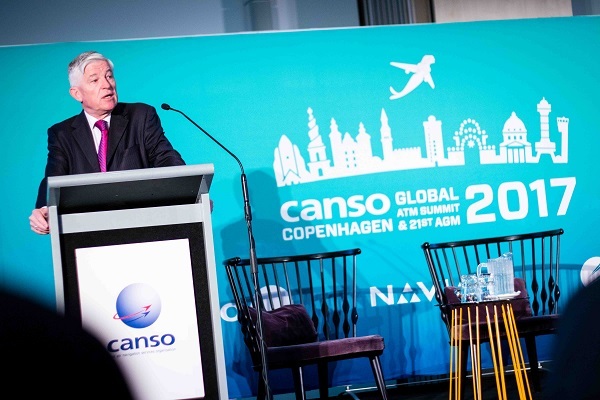 The CANSO Global ATM Summit and 21st Annual General Meeting was hosted by Naviair in Copenhagen, Denmark, on 12-15 June and attended by 243 delegates from around the world. The next CANSO Global ATM Summit and 22nd AGM will take place in Bangkok, Thailand, 10-13 June 2018, hosted by Aeronautical Radio of Thailand Limited (AEROTHAI).